Despite a consolidated vendor landscape, the global biotech flavor market witnesses a highly competitive environment, finds Transparency Market Research (TMR) in a recent study. As per the report, leading companies mostly rely on strategic collaborations and mergers and acquisitions to gain increased visibility. This trend is likely to continue over the coming years, thus intensifying the prevailing competition. 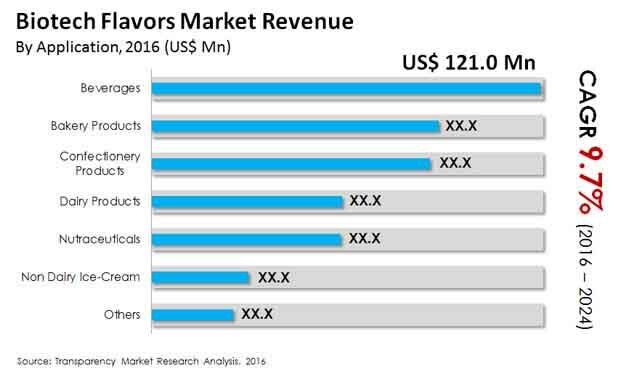 Some of the leading players operating in the global biotech flavors market are Naturex, Firmenich S.A., Kerry Group Plc, Frutarom Industries Ltd., International Flavors & Fragrances Inc., Takasago International Corp., Sensient Technologies Corp., Bell Flavors and Fragrances, Symrise AG, and Givaudan. TMR has predicted the global biotech flavors market to exhibit a CAGR of 9.70% between 2016 and 2024. At this pace, the market will reach US$991.0 mn by the end of 2024, as against its valuation of US$430.6 mn in 2015. In terms of volume, TMR projects the market to touch 23,980.3 tons over the course of the forecast period. The rising demand from beverages as compared to other end users is likely to augment growth in the market. The rising consumption of flavored beverages around the world will thus catapult the segment at the market’s fore. Regionally, the global biotech flavors market is led by North America owing to the prevalence of high awareness regarding health benefits of biotech flavors. Besides this, the market is expected to witness high paced growth in Asia Pacific on account of the increasing demand from India and China. The rising trend of health and wellness across emerging nations will aid the market’s expansion in Asia Pacific. In addition to this, the rising demand for beverages will support the market’s growth in the region. The market will immensely benefit from the increasing health consciousness among consumers. Biotech-based flavors contain natural ingredients, which will fuel its use in food and beverages, subsequently fuelling sales prospects for the market. As per TMR, the market will witness increasing demand in developed countries as they show a high degree of awareness. Concerns regarding negative impact of artificially produced food flavors and the rising knowledge about the nutritional benefits of biotech flavors will boost the biotech flavors market in the coming years. While the demand for biotech flavors is forecast to scale higher in the near future, their low shelf-life and issues pertaining to their stability may hinder the market to an extent. Nonetheless, the rising awareness among consumers about the nutritional values of biotech flavors will boost their demand in the coming years. These flavors are derived using biotech processes such as microbial fermentation, bio-conservation, and tissue culture. These processes help in keeping intact the nutritional value of fruits or vegetables from which flavors are derives, thus, eliminating risk of adverse impact. Flavors derives using the aforementioned processes are therefore considered more natural and healthier than their chemically synthesized counterparts.